372 short-term observers of the campaign "Human Rights Defenders for Free Elections" are involved in daily observation of the early voting at 186 polling stations across the country. Observation results are processed on a daily basis and constitute a representative sample (observation covers 3.1% of the 5,971 polling stations). These data allow observers to estimate the basic tendencies of early voting. The below information was processed based on data received from 189 polling stations as of 23:00, September 8. According to the campaign’s observers, the number of voters registered during the third day of early voting amounted to 16,612 people, while the PECs’ protocols claimed there were 18,685 persons. The difference amounts to 2,073 people, or 11%. In the 2012 parliamentary elections, the difference was 4.6% based on observation at 130 polling stations. The abnormally large discrepancy between the numbers in the official protocols and the data reported by the observers was documented in the following polling stations: PEC No. 38, DEC No. 85 in Mahilioŭ (PEC data — 263, observers’ reports — 46), PEC No. 11, DEC No. 84 in Mahilioŭ (184 and 81, respectively). 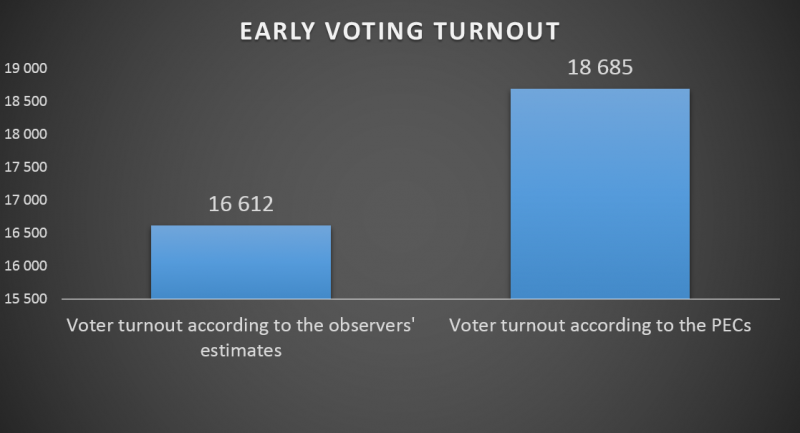 During the first three days of early voting, overstated voter turnout has been reported in electoral district No. 46 in Svietlahorsk: according to PEC No. 17, on September 8, 187 people voted at the polling station, while the campaign’s observers said there were 55 votes; in PEC No. 23 — 115 and 50, respectively; in PEC No. 28 — 107 and 62, respectively; in PEC No. 22 — 131 and 68, respectively. In PEC No. 2 of DEC No. 29 located in Brest, 157 people voted according to the commission, and the observers said there were 45 people. In PEC No. 8 of DEC No. 6 in Baranavičy — 210 and 67, respectively. The situation is similar in the Homieĺ region: PEC No. 6, DEC No. 44 in Rečyca (181 and 61, respectively), PEC No. 9, DEC No. 32 in Homieĺ (350 and 135, respectively). Observers in Minsk and Minsk region also report a high difference between their estimations and the official voter turnout: PEC No. 420, DEC No. 103 in Minsk (117 people voted according to the commission, and 68 according to observers); PEC No. 91, DEC No. 93 in Minsk (165 and 26, respectively), PEC No. 402, DEC No. 103 in Minsk (127 and 93, respectively), PEC No. 21, DEC No. 68 in Salihorsk (145 and 74, respectively). 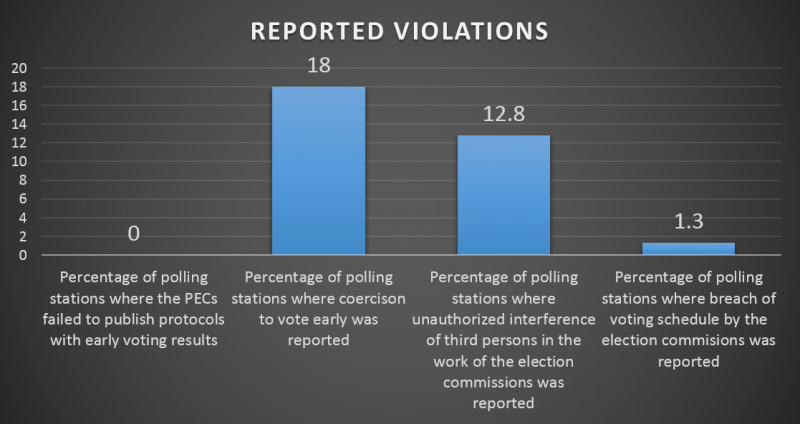 In general, the difference between the PEC data and the observers’ reports on voter turnout was documented at 50.7% of the polling stations covered by the observation. Just like in previous election campaigns, the observers report massive coercion of students to vote early. In a number of educational institutions, the authorities used teacher-parent meetings to force students to vote early.